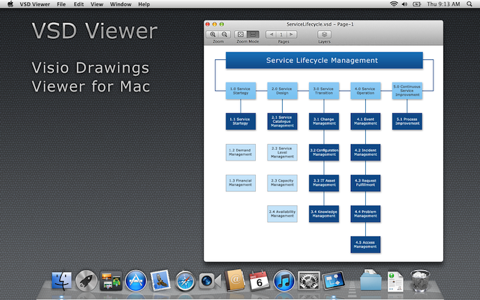 VSD Viewer Mac is a tool designed to support the use of the Visio documents by Mac OS users, enabling them to open and read MS Visio drawings on Mac. VSD Viewer Mac opens the file directly on a computer without conversion on external Web Servers. Viewing Visio documents is as simple as drag and dropping of files (with a .vsd, .vsdx, .vdx extension) to the Application window. If you need more information please contact the developers of VSD Viewer Mac (Nektony LLC), or check out their product website.